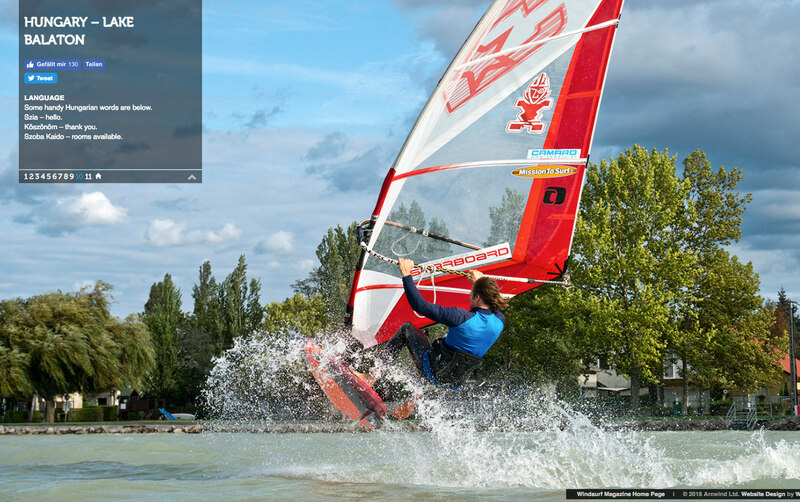 The UK Windsurf magazine featured the travel story about Lake Balaton in their print issue September 2018 and as well published it on their website here. If you are interested to read a few details about the biggest lake in central Europe and the best windsurfing spots, I really recommend you the article. But the Hungarian Sea, Magyar Enger or Balcsi, as it is commonly called by the locals, can also be quite different. If a proper cold front from Northwest is going through, the lake can turn into a wild monster within a very short time, which makes the windsurfer’s heart beat faster. The „steppe lake“ (endorheic basin) with reeded banks, which derives its name from the Slavic blatna, can be translated as a swampy march. It turns brown over several hours, but also for several days. Sand and mud particles are thrown up from the ground and broken reed drifts on the surface of the huge lake. On strong days, the display of the wind meter can climb to over 7 Beaufort. We got that wind force several times at Baladtonfenyves, Balatonlelle, Fonyod light and Szantod. The so far strongest wind speed of 129.6 km / h was measured in July 1961. The onshore wind is already sweeping over Balatonberény, where we cross the Balaton road to the southern shore of the lake for the first time. The surface of the lake is completely cooking. Thousands of sharp waves jump in the direction of concrete walls and islands of reeds offshore, and the metal spiders scattered around the water for ambitious anglers will probably remain unoccupied all afternoon long. The lake riots wildly. The air has cooled noticeably, but the water has still stored the summer residual heat. Luckily!! 15 km further towards the north-east, the probably most famous spot on the south shore, Balatonfenyves awaits us. It’s not busy. We are almost alone at the famous spot. The north-west wind blows constantly, but not as strong as expected. Obviously the wind is accelerated through the valleys between the volcanic mountains. Still it’s good enough to ride with the Freestyle board and a 5,8m sail. Later we join Eva at her little bar and eat local food and get a great coffee and a sweet Palatchinka.